In this post, we introduce the basic git commands you need to know to successfully work with git. Read on to learn how to use git from the terminal! There are many different ways to use Git. The most common are the original command line tools and GUI ( Graphical User Interfaces). Here, we will cover the most important commands you should know about when you are working with Git. The command line is the only place you can run all Git commands. If you know how to run the command-line version you can probably also figure out how to run the GUI version. Also, while your choice of graphical client is a matter of personal taste, all users will have the command-line tools installed and available. You can read more on git's official online book. Before we start, be sure to know how to use the Terminal in Mac or Command Prompt or Powershell in Windows and have git installed on your system. First, you might ask yourself what is Git actually and what can you do with it? Git is a fast, scalable, distributed revision control system with a rich command set that provides both high-level operations and full access to internals. At Kolosek (where I work), we use Git for every application we create, including Ruby on Rails projects, to make it easier to work as a team and achieve our goal. Everything can be added to your git repositories, even your Controller tests! $git --version: Find out your current Git suite version using this command. $git --help: Every good programmer should know about this option, it will show you the most used Git Commands, and it can also print all available commands with --all or -a. $git -C <path>: Instead of running Git from the current working directory, you can run it from the given <path> instead. -C <path> command affects other options that expect path names like --git-dir and --work-tree because their path names would be made relative to the working directory caused by the -C option. $git -c <name>=<value>: You can very easily override values from your configuration files. The <name> has to be in the same format as listed by git config, while the <value> is your new parameter value. $git --exec-path[=<path>]: This command helps you find the path where your core Git programs are installed. Another way to do this is by setting the GIT_EXEC_PATH environment variable. $git --git-dir=<path>: Always use this option, whenever you need to set a path to the repository or set the GIT_DIR environment variable. And, that's it! For now, at least. This was only the first part of the tutorial! 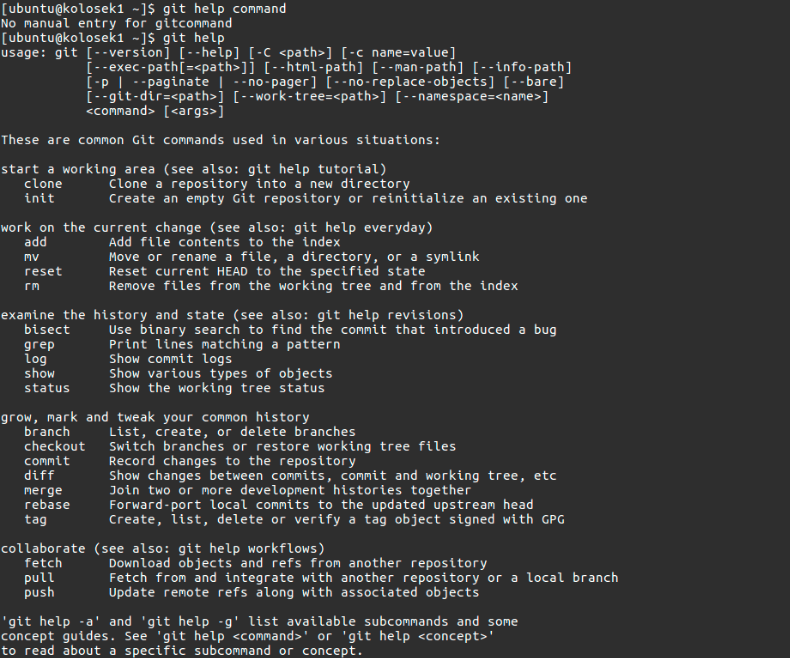 In the next one, we will cover all the other Git commands, be sure to stay tuned.